and welcome back to the week after labor day. such a lazy week. hope you all had a fabulous relaxing weekend. i know i did. i did completely nothing and it was GREAT. lounged by the pool, church, dinner out with the hubs, outlet shopping, sleeping in, card games, and cocktails. there wasn’t much for an outfit post these past couple of days. basically wore shorts and a blousy shirt like i did the last outfit post. or jeans and a tshirt. during my outlet shopping adventure i did manage to grab a couple goodies. all shoes. unfortunately there were no clothes that interested me. the price wasn’t worth it or they didn’t fit right. My body proportions are weird right now after I lost weight for the wedding. I can’t find clothes that fit me properly. Perhaps its a sign that I shouldn’t be buying clothes. I have been coveting Kim Kardashian’s Christian Louboutin laceup platforms/booties for a while now. Co-vet-ting. Hard. I love this look here. The army green romper with the booties. FAB-U-LOUS. I love a great army green military look. I’ve always been a girl in love with the combination of femininity with a touch of masculinity/roughness with clothes. BIG FAN! If only I could find my army green dress I left at my mother’s house a year ago, I’d have the perfect outfit, but somehow it got misplaced it. I say my sister stole it or my mother gave it away to the Salvation Army. Anyhow, after seeing this and knowing that the military trend with a hint of femininity was going to be a big thing in the fall I was on the search for some shoes that looked similar. Wasn’t really feeling these Chinese Laundry ones though. Something about the faux wooden heel that turns me off. While a pretty affordable alternative, it’s not my style that is until I walked into the Nine West outlet and saw these beauties. I have a plan to have a lookbook post with these shoes soon. SO SO IN LOVE with these shoes! I also got a pair of flats. I’m not a huge fan of flats but I needed something a little more girly than my chucks (Which I love but get the weirdest looks when I wear them out for dinner and ask for alcohol drinks. BOO to look like I’m 18.). I’ve been a big fan of Cole Haan, especially with their Nike Air insoles. Some of their shoes are more geared to the fashionable woman who want comfort but don’t want that Naturalizer look. When I went to Napa a couple weeks ago the Hubs and I went to the Vacaville outlets and I wanted a pair of black Cole Haan flats but alas they didn’t have my size. DAMN my small feet. So when we went to the outlets this weekend and I was thoroughly expecting not to find anything in my size. 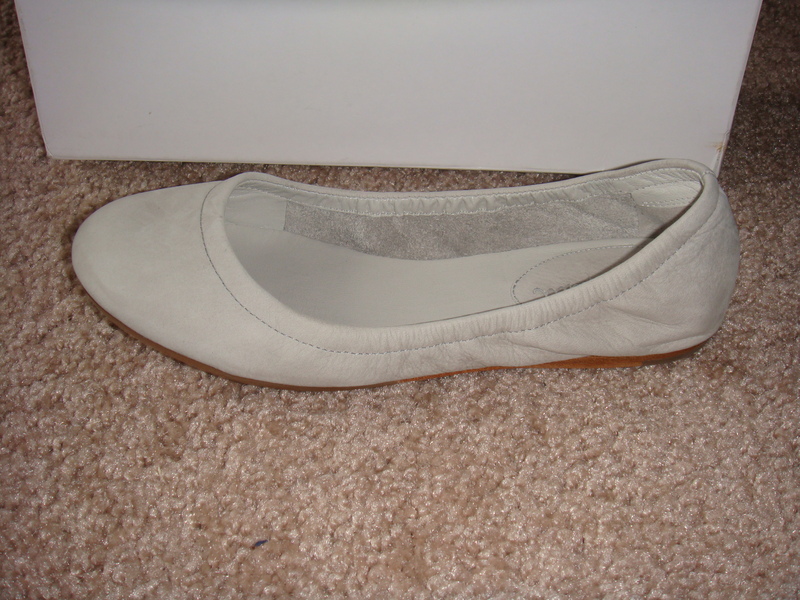 I didn’t find any black flats but I did find these Gray Nubuck flats, even better. Everyone and their mom has black flats, so these flats are a nice change. The husband isn’t a fan of flats either but he said these are much better than the black flats I was originally trying to buy. Simple yet neutral and with Nike Air insoles. YAY! I’m still on the prowl for peep-toe booties but I don’t know if its something I need at this point. Although, Target has a couple that are pretty affordable. Maybe I’ll check those out this weekend. But I am still on the prowl for a lot of stuff. Hoping to go to the thrift shop sometime soon and find some treasures. Haven’t been in a while and haven’t been to a thrift shop that isn’t super overpriced here. We shall see. Hopefully the yelp reviews won’t let me down when I do finally go. Next > ignorance is bliss?